Sandbakels Sandkake (left) are some of my favorite Norwegian Christmas cookies that I make as a special treat for my family and friends through-out the year. 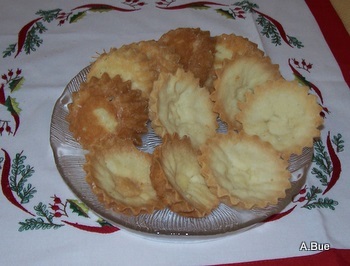 In Norway, these traditional cookies all the way from Norway are a "must have", at Christmas time in our family. You'll be ready for company at any time if you keep a bunch of these treats in your pantry for a quick and easy dessert. 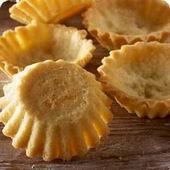 These crisp mini-tart cookies can be filled with fruit, berries, nuts, chocolate, puddings, mousse and whipped cream/ice cream or enjoy plain. Form small ball and press into mold. Bake at 350°F. for 10 minutes. Make sure molds are cooled completely before place cookie dough into mold again. Warm molds will melt the butter and deform the shape of the tart. Remove molds from baking sheet and turn them over to cool. They will release easily when cooled. It is a good idea to have more than one set of molds. That way, you can bake one batch and make another one, while one batch is cooling. It is a big time saver. Store in airtight container.